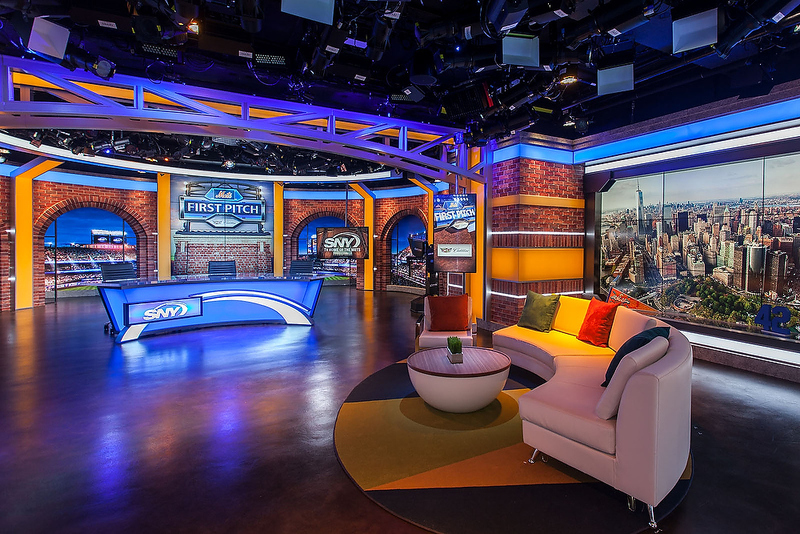 Ahead of this year’s MLB season, SNY rolled out a major upgrade of its production facilities, part of a move to 4 Trade Center in New York City. 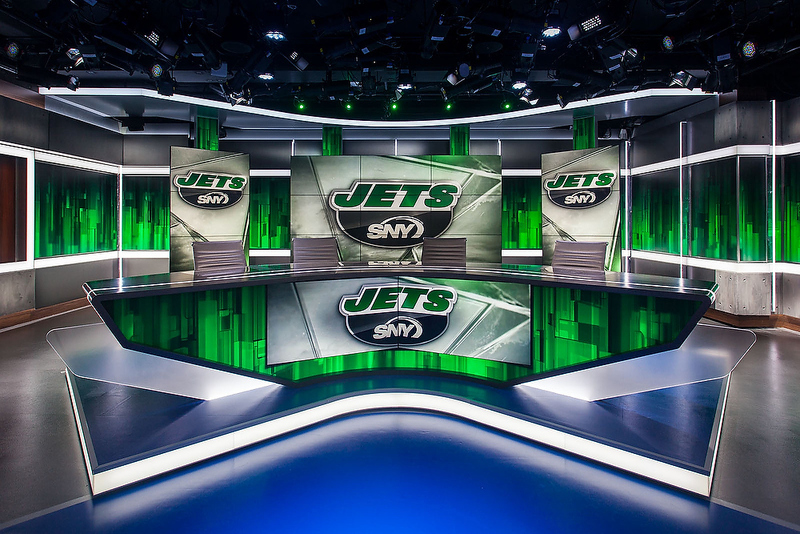 The project, which includes three studios for the regional sports network, features the latest in studio technology and team iconography, aiming to capture the diverse fanbase of the New York Mets and New York Jets. Talk a bit about the overall design brief? Sportsnet New York was relocating their entire operation from their 6th Avenue space to a brand new location at 4 World Trade Center. As part of the broadcast move, they were expanding from a single, street-level studio, to (3) new studios on the 50th floor. Named in honor of Mets’ greats Mike Piazza (Studio 31) and Tom Seaver (Studio 41), and legend Jackie Robinson (Studio 42), the three spaces take up about a quarter of the 50th floor. Studio 42 is a corner space with an amazing view of the Brooklyn Bridge and lower Manhattan. 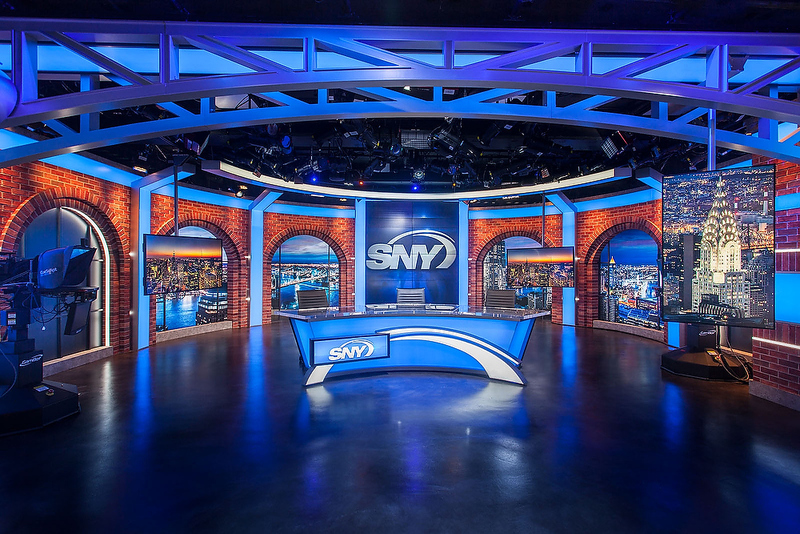 SNY was looking for designs that elevated their brand, took advantage of the new spaces and gave them more flexibility and storytelling capability. We strove to emulate the look and feel of the places where sports are played and enjoyed. Modern, yet welcoming. Technology-enhanced, while still grounded in rich materials and textures. The design for Studio 31 alludes to stadium architecture and the aesthetic of a luxury box. Concrete, steel, glass and wood anchor the design, with hits of the SNY brand blue appearing in columns and patterns on the floor. The broadcast home of the Mets is Studio 41. Inspired by the Jackie Robinson Rotunda at Citi Field, brick arches wrap the main anchor area and metal trusses cut through the space. The floor is actually stained concrete, to match the one at the stadium entrance. And our inspiration for Studio 42 is the spectacular view itself. This small studio features a magnificent corner window overlooking the Brooklyn Bridge and lower Manhattan. The scenery here simply frames the view, letting it take center stage. What role does technology play in the design? 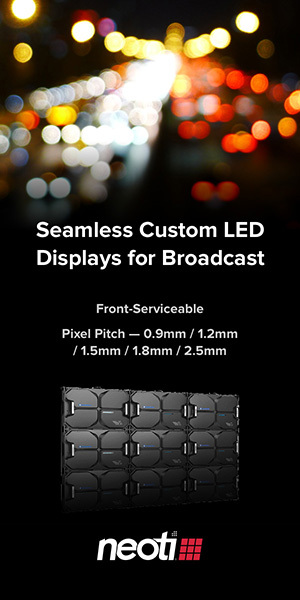 To enable storytelling in a compelling way, it was very important to provide a wide range of technology in the spaces. Large monitor walls are present in a variety of configurations in both of the larger studios. It was our goal to create a design with the ability to present supporting video for the talent, whether seated, standing or walking. The displays help create a sense of place, enrich the backgrounds and are powerful communication tools. In addition, each of the larger studios has touch screen displays, ready for action. How did you incorporate versatility into the design, knowing the network would cover multiple sports teams/leagues? Versatility really was the key to the designs. 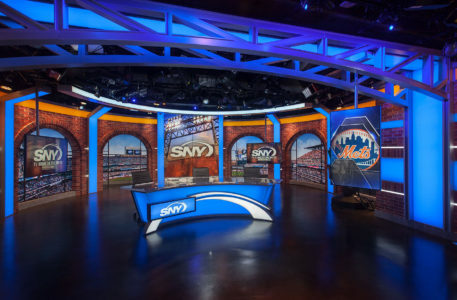 Not only does SNY cover a variety of sports and teams, it has multiple shows that happen in the same studios. 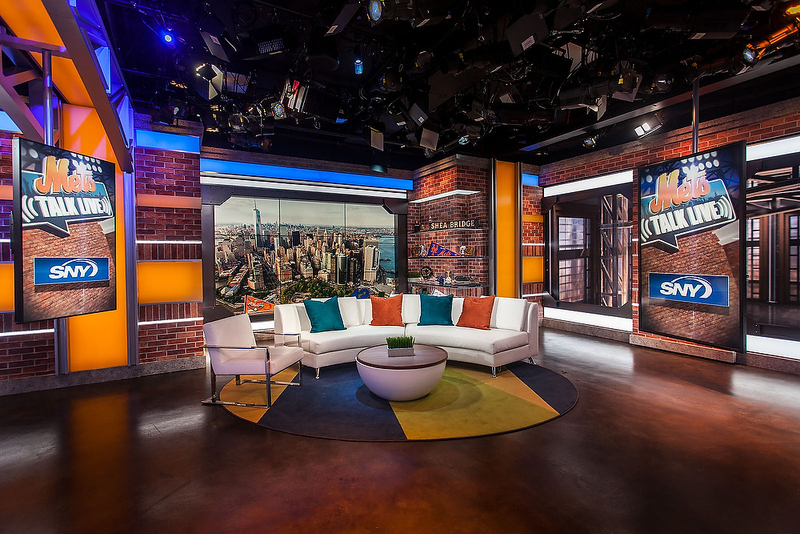 The set designs needed to provide tools to customize the spaces for all of the shows and sports being showcased. We made both of the primary studios 360 degree broadcast environments. You can literally shoot in every direction, which was no small feat for the relatively small size of the spaces. Just turning the camera around offers a fresh background. Color-changing light boxes and the integration of displays throughout the sets allow the studios to be instantly transformed by lighting and graphics. Tracking monitors can also rotate to both portrait and landscape orientations. The archways in Studio 41 are filled with light boxes which illuminate rear-lit printed graphics. Four (4) separate views are featured on staggered rollers. Views of Citi Field and the New York skyline, at both night and day, can be switched out at the press of a button. Any unique challenges with creating a studio in an office tower? A low ceiling height was certainly a challenge. We endeavored to create sweeping environments that would shoot deceptively larger than they really are. The studio had ceiling and grid heights of only 12’-3″ and 11’-7″, respectively. LDG did an incredible job keeping the lighting instruments as high as possible to still allow for grand wide shots. Sprinklers and HVAC also presented complications with such low ceilings. The fact that the studios were literally being built in tandem with our set construction made for opportunities and challenges. The entire team, from SNY to our design team to the architects and acoustical consultants to the AV integrators and construction contractors, did a lot of troubleshooting. Together, we came up with compromises and solutions to land where things looked their best, while maximizing the studio functionality. It was a complicated puzzle to figure out, but the results are really rewarding.